Shinichi Hirai is head of the Hirai Laboratory for Integrated Machine Intelligence, Ritsumeikan University, Biwako-Kusatsu Campus, Kusatsu, Shiga, Japan. The lab was founded in 1996. Hirai researches tensegrity as a new paradigm for robotic movement. The robots in Hirais lab consist of rigid elements connected by tensional members. Changing the tension, hence the length, of the tensional members yields locomotion over terrain. 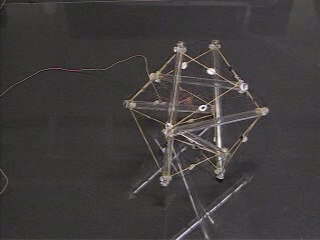 Tensegrity robot achieving locomotion by changing the tension of its tensile network. By Hirai Lab. This page was last edited on 24 November 2018, at 16:14.